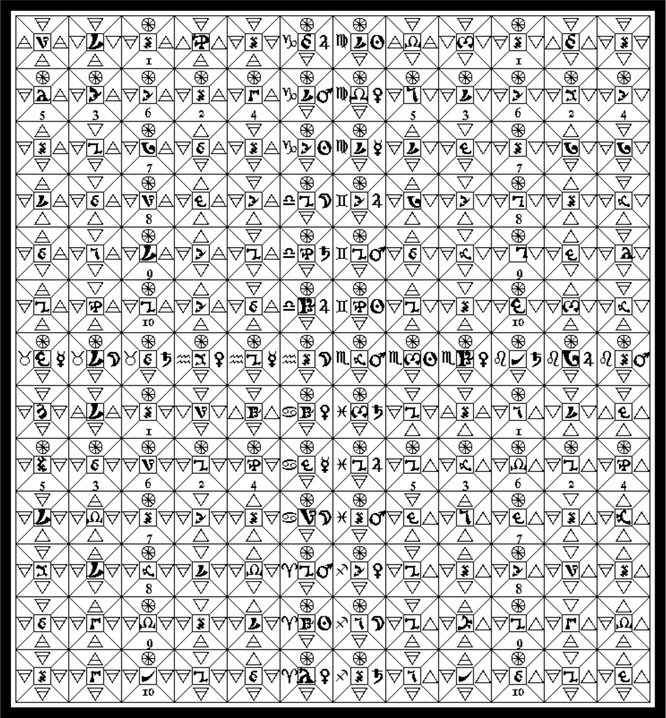 Reconstructed from two part article in Equinox I;7, and I;8 By Fra. : A∴ A∴ [Sol in Gemini, An. 88]. With additions from said articles. The Skryer obtained from certain Angels a series of seven talismans. These, grouped about the Holy Twelvefold Table, similarly obtained, were part of the furniture of the Holy Table, as shewn in Plate I., opposite. Other appurtenances of this table will be described hereafter. Other Pantacles were obtained in a similar manner. Here (Plate II.) is the principal one, which, carved in wax, was placed upon the top of the table. On four others stood the feet of the table. Note first the Holy Sevenfold Table containing seven Names of God which not even the Angels are able to pronounce. 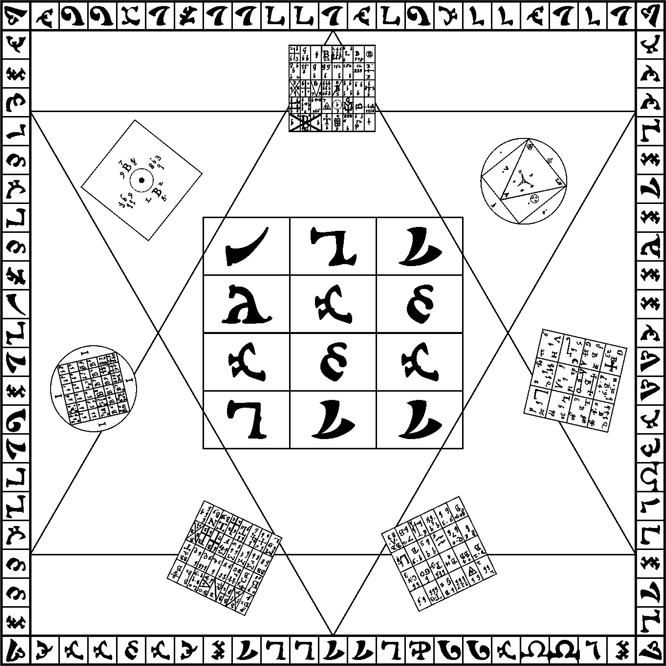 These names are seen written without the heptagram within the heptagon. (1) Filiae Bonitatis or Filiolae Lucis. See all these names in the heptagram of the great seal. These names will be found in the Pentagram and about it. These angels are the angels of the Seven Circles of Heaven. The Shew-stone, a crystal which Dee alleged to have been brought to him by angels, was then placed upon this table, and the principal result of the ceremonial skrying of Sir Edward Kelly is the obtaining of the following diagrams, Plates III. - VIII. He symbolized the Fourth-Dimensional Universe in two dimensions as a square surrounded by 30 concentric circles (the 30 AEthyrs or Aires) whose radii increased in a geometrical proportion. Plate III. gives the general view. Plate IV. gives the complete attribution of the tablet of Air. The 6th file is called Linea Patris. The 7th file is called Linea Filii. The 7th line is called Linea Spiritus Sancti. This great cross divides the Tablet into four lesser (sub-elemental) Tablets, the left-hand top corner being Air of Air, the right-hand top corner Water of Air, the left-hand bottom corner Earth of Air, the remaining corner Fire of Air. Each of these lesser Tablets contains a Calvary Cross of ten squares, which governs it. Plates V., VI., and VII. are similar for the other elements. 1. Linea Spiritus Sancti gives the Three Holy Names of God of 3, 4, and 5 letters respectively. 2. A whorl around the centre of the Tablet gives the name of the Great Elemental King, RAAGIOSL [similarly for Air BATAIVAH, for Earth ICZHHCAL, for Fire EDLPRNAA]. 3. The 3 lines of the central cross of Father, Son, and Holy Ghost give the names of 6 seniors. [Thus the 4 tablets hold 24 “elders,” as stated in the Apocalypse.] They are drawn of seven letters, each from the centre to the sides of the tablet. These three sets of names rule the whole tablet, and must be invoked before specializing in the lesser angles of the sub-elements. The Great Watch-Tower of The East, Attributed to Air. The Great Watch-Tower of The West, Attributed to Water. The Great Watch-Tower of The North, Attributed to Earth. The Great Watch-Tower of The South, Attributed to Fire. The Black Cross, or Table of Union. Attributed to Spirit. 4. The Calvary Crosses. The name upon the cross read vertically is the name which calls forth the powers of the lesser angle. 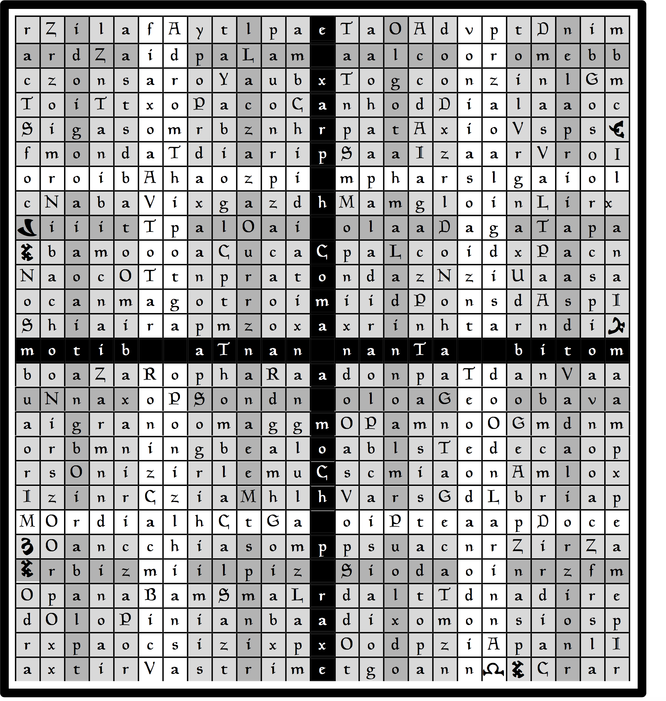 The name read horizontally on the cross is that which compels the evoked force to obedience. 5. Above the bar of the Calvary Cross remain in each case four squares. These are allotted to the Kerubim, who must next be invoked. 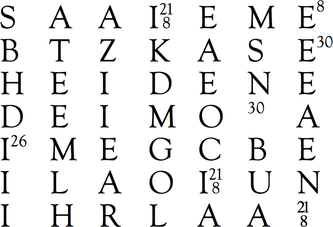 MTDI, being metatheses of these four letters. The initial determines the file governed; e.g. TDIM governs the file which reads T(o)ILVR. These angels are most mighty and benevolent. They are ruled by names of God formed by prefixing the appropriate letter from the “black-cross” to their own names. et cetera, form bases for these triliteral names. 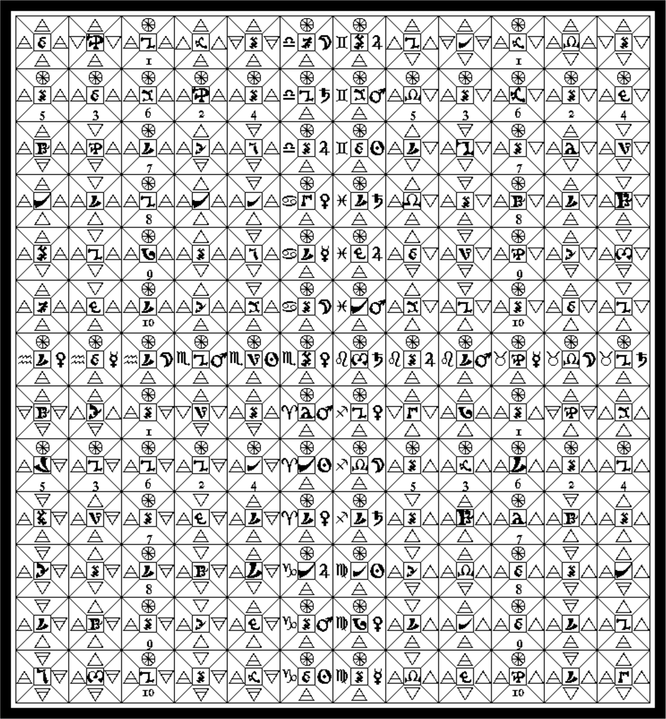 The following rules explain how the sides of the pyramids of which the squares are formed are attributed to the Sephiroth, Planets, Elements, and Zodiacal signs. 1. Great Central Cross. 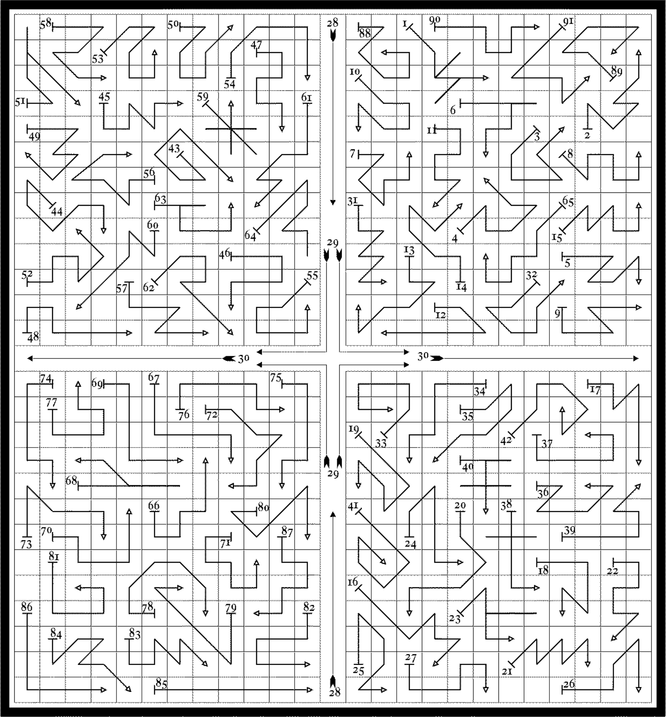 This has 36 squares, for the decantes of the Zodiac. On the left side of the Pyramid, Linea Patris has the Cardinal signs, the sign of the Element itself at the top, in the order of Tetragrammaton (Fire, Water, Air, Earth) going upwards. 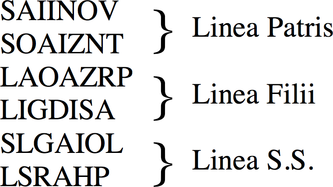 Linea Filii has the Common signs in the same order. Linea S.S. has the Cherubic signs, that of the element on the left, in the same order, right to left. But the order of the decans in each sign is reverse, and thus the planets which fill the right-hand side of the Pyramids go in the first two cases downwards, and in the third from left to right. The upper sides of the Pyramids are all attributed to the Element of Spirit, the lower sides to the Element of the Tablet. Each square is also referred to the small card of the Tarot which corresponds to the Decan (see 777). The upper sides of the Pyramids are uniformly given to Spirit, the lower sides to the Sephiroth, in the order shewn. The left-hand sides are attributed to the element of the Tablet, the right-hand sides to the sub-element of the lesser angle. The upper sides pertain to the element of the Tablet, the lower sides to the sub-element. Right-and left-hand sides in this case correspond, according to a somewhat complex rule which it is unnecessary to give here. The attributions to the Court Cards of the Tarot naturally follow. The left-hand side refers to the element of the Tablet, the right-hand side to the sub-element of the lesser angle. 5. The Black Cross of Central Tablet. The upper and lower sides are equally attributed to Spirit. The left-hand sides to the element of the file, in this order from left to right: Spirit, Air, Water, Earth, Fire. The right-hand sides to the element of the rank in this order: Air, Water, Earth, Fire. Follows Plate IX. the Alphabet in which all this is written. 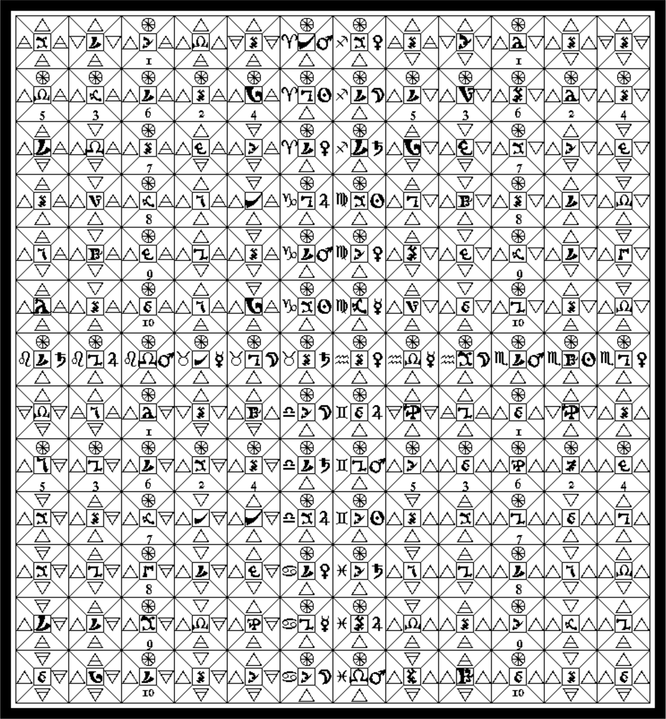 It is the Alphabet of the Angelic Language. The invocations which we possess in that tongue follow in their due place. These are Most Solemn Invocations. Use these only after other invocations. Key tablet hath 6 calls, 1 above other 5. 1: Governs generally as a whole the tablet of Union. Use it first in all invocations of Angels of that tablet, but not at all with other 4 tablets. 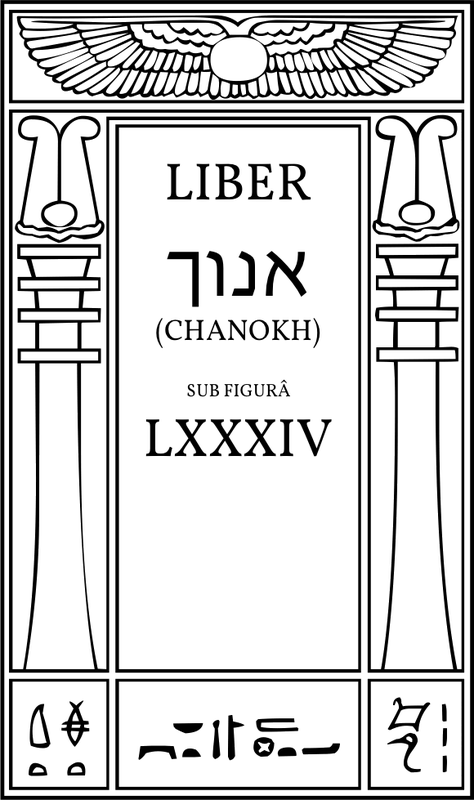 2: Used as an invocation of Angels e h n b representing governance of Spirit in the tablet of Union: also precedes, in the second place, all invocations of the Key tablet Angels. Not used in invocations of 4 other tablets. 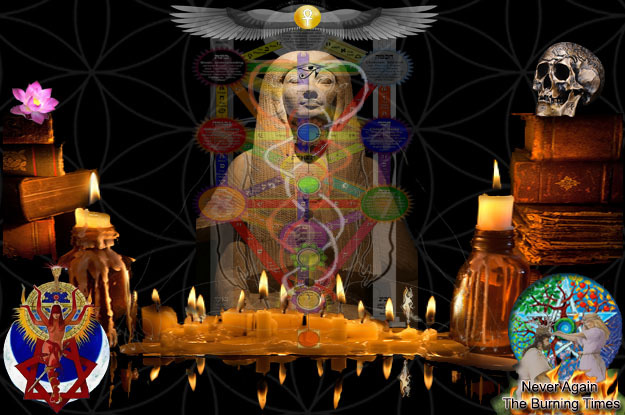 3: Used to invoke Angels of the letters of the line e x a r p.
The remaining 12 Keys refer to the remaining lesser angles of the tablets, the order of the elements being Air, Water, Earth, Fire. 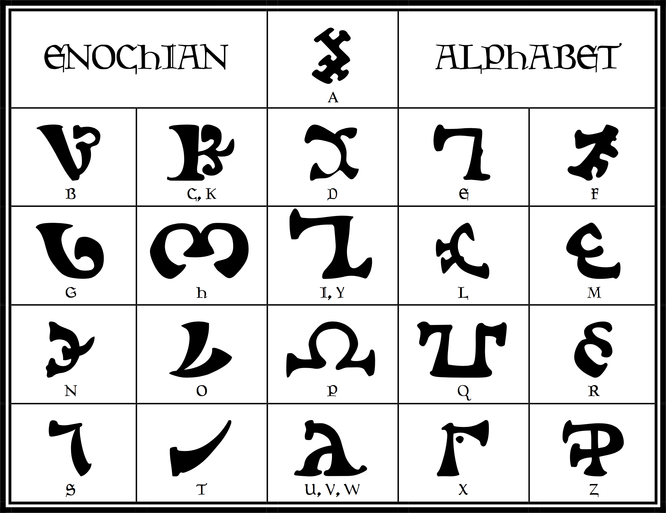 Pronounce Elemental language (also called Angelic or Enochian) by inserting the next following Hebrew vowel between consonants, e.g. e after b (bEth), i after g (gImel), a after d, etc. THE OPENING OF THE PORTAL OF THE VAULT OF THE ADEPTS. אוקה P . R . K . Th PAROKETH, the Veil of the Sanctuary. The Sign of the Rending of the Veil. The Sign of the Closing of the Veil. [Give these.] Make the Invoking Pentagrams of Spirit. In the name of IHVH ALVH VDOTh, I declare that the Spirits of Spirit have been duly invoked. The Knock 1 — 4444. OL sonuf vaoresaji, gohu IAD Balata, elanusaha caelazod: sobrazod-ol Roray i ta nazodapesad, Giraa ta maelpereji, das hoel-qo qaa notahoa zodimezod, od comemahe ta nobeloha zodien; soba tahil ginonupe pereje aladi, das vaurebes obolehe giresam. Casarem ohorela caba Pire: das zodonurenusagi cab: erem Iadanahe. Pilahe farezodem zodenurezoda adana gono Iadapiel das home-tohe: soba ipame lu ipamis: das sobolo vepe zodomeda poamal, od bogira aai ta piape Piamoel od Vaoan2)! Zodacare, eca, od zodameranu! odo cicale Qaa; zodoreje, lape zodiredo Noco Mada, Hoathahe I A I D A! 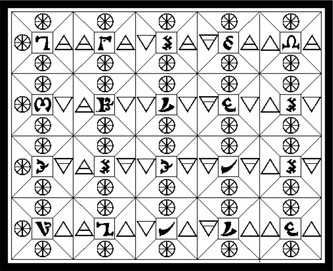 86 words in this Enochian Call. I REIGN over ye, saith the God of Justice, in power exalted above the Firmament of Wrath, in whose hands the Sun is as a sword, and the Moon as a through thrusting Fire: who measureth your Garments in the midst of my Vestures, and trussed you together as the palms of my hands. Whose seats I garnished with the Fire of Gathering, and beautified your garments with admiration. To whom I made a law to govern the Holy Ones, and delivered ye a Rod, with the Ark of Knowledge. Moreover you lifted up your voices and sware obedience and faith to him that liveth and triumpheth: whose beginning is not, nor end cannot be: which shineth as a flame in the midst of your palaces, and reigneth amongst you as the balance of righteousness and truth! Move therefore, and shew yourselves! Open the mysteries of your creation! Be friendly unto me, for I am the Servant of the same your God: the true worshipper of the Highest! 169 words in this English Call. ADAGITA vau-pa-ahe zodonugonu fa-a-ipe salada! Vi-i-vau el! Sobame ial-pereji i-zoda-zodazod pi-adapehe casarema aberameji ta ta-labo paracaleda qo-to lores-el-qo turebesa ooge balatohe! Giui cahisa lusada oreri od micalapape cahisa bia ozodonugonu! lape noanu tarofe coresa tage o-quo maninu IA-I-DON. Torezodu! gohe-el, zodacare eca ca-no-quoda! zodameranu micalazodo od ozadazodame vaurelar; lape zodir IOIAD! CAN the Wings of the Winds understand your voices of Wonder? O you! the second of the First! whom the burning flames have framed in the depth of my Jaws! Whom I have prepared as cups for a wedding, or as the flowers in their beauty for the chamber of Righteousness! Stronger are your feet than the barren stone: and mightier are your voices than the manifold winds! For you are become a building such as is not, save in the Mind of the All-Powerful. Arise, saith the First: Move therefore unto his servants! Shew yourselves in power, and make me a strong Seer-of-things: for I am of Him that liveth forever! [Invokes: The File of Spirit in the Tablet of Spirit. E — the Root of the Powers of Air. H — the Root of the Powers of Water. N — the Root of the Powers of Earth. B — the Root of the Powers of Fire. GIVE the Sign of Shu. [Knock.] Let us adore the Lord and King of Air! Shaddai El Chai! Almighty and ever-living One, be Thy Name ever magnified in the Life of All. (Sign of Shu.) Amen! [Make the Invoking Pentagram of Spirit Active in these names: AHIH. [Make the Invoking Pentagram of Air in these names: IHVH. And Elohim said Let us make Adam in our own image, after our likeness, and let them have dominion over the fowls of the air. In the Names of IHVH and of ShDI AL ChI, Spirits of Air, adore your Creator! [With air-dagger (or other suitable weapon) make the sign of Aquarius.] In the name of RPAL and in the Sign of the Man, Spirits of Air, adore your Creator! [Make the Cross.] In the Names and Letters of the Great Eastern Quadrangle, Spirits of Air, adore your Creator! [Hold dagger aloft.] In the Three great Secret Names of God, ORO IBAH AOZPI that are borne upon the Banners of the East, Spirits of Air, adore your Creator! [Again elevate dagger.] In the Name of BATAIVAH, great King of the East, Spirits of Air, adore your Creator! In the Name of Shaddai AL Chai, I declare that the Spirits of Air have been duly invoked. 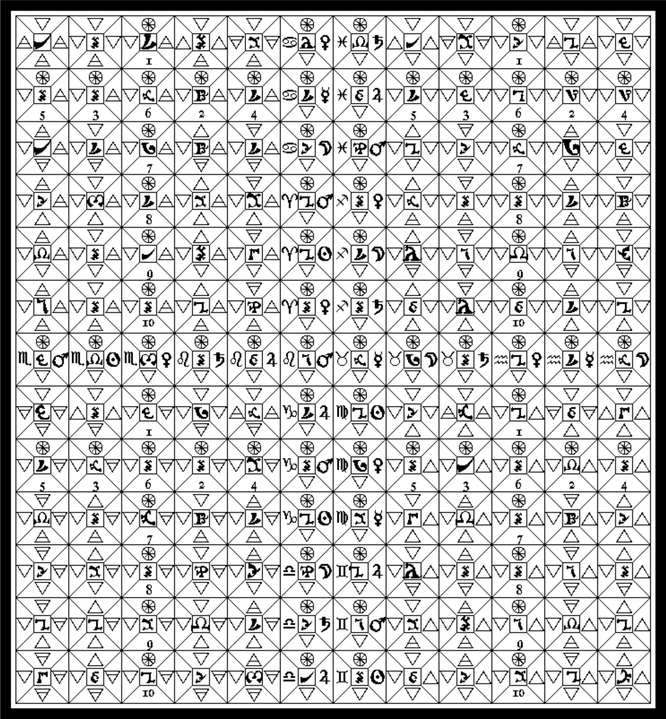 80 words in this Enochian Call. BEHOLD! saith your God! I am a circle on whose hands stand Twelve Kingdoms. Six are the seats of living breath: the rest are as sharp Sickles, or the Horns of Death. Wherein the creatures of Earth are and are not, except (in) mine own hands; which sleep and shall rise! In the First I made ye stewards, and placed ye in twelve seats of government: giving unto every one of you power successively over the 456 true ages of time: to the intent that from the highest vessels and the corners of your governments you might work my Power, pouring down the fires of Life and increase continually on the earth. Thus you are become the skirts of Justice and Truth. In the name of the same your God, lift up, I say, yourselves! Behold! His mercies flourish, and (His) Name is become mighty among us. In whom we say: Move! Descend! and apply yourselves unto us as unto the partakers of His Secret Wisdom in your Creation. 167 words in this English Call. [Invokes: EXARP; the whole Tablet of Air. The angle of Air of Air. The Prince of the Chariot of the Winds. GIVE the Sign of Auramoth. [Knock.] Let us adore the Lord and King of Water! Elohim Tzabaoth! Elohim of Hosts! Glory be to the Ruach Elohim which moved upon the Face of the Waters of Creation! AMEN! [Make the Invoking Pentagram of Spirit Passive and pronounce these names: AHIH. And Elohim said: Let us make Adam in Our image; and let them have dominion over the Fish of the Sea! In the Name of A L, Strong and Powerful, and in the name of ALHIM TzBAVTh, Spirits of Water, adore your Creator! [Make Sigil of Eagle with cup.] In the name of GBRIAL and in the sign of the Eagle, Spirits of Water, adore your Creator! [Make cross with cup.] In all the Names and Letters of the Great Quadrangle of the West, Spirits of Water, adore your Creator! [Elevate cup.] In the three great Secret Names of God MPH ARSL GAIOL that are borne upon the Banners of the West, Spirits of Water, adore your Creator! [Elevate cup.] In the Name of RAAGIOSEL, great King of the West, Spirits of Water, adore your Creator! In the name of Elohim Tzabaoth, I declare that the Spirits of Water have been duly invoked. I HAVE set my feet in the South, and have looked about me, saying: are not the thunders of increase numbered 33, which reign in the second Angle? Under whom I have placed 9639: whom none hath yet numbered, but One; in whom the Second Beginnings of Things are and wax strong, which also successively are the Numbers of Time: and their powers are as the first 456. Arise! you sons of Pleasure! and visit the earth: for I am the Lord your God; which is and liveth (for ever)! In the name of the Creator, move! and shew yourselves as pleasant deliverers, that you may praise him among the sons of men! [Invokes: HCOMA; the whole tablet of Water. The Angle of Water of Water. GIVE the Sign of the God SET fighting. [Knock.] Let us adore the Lord and King of Earth! Adonai ha Aretz, Adonai Melehk, unto Thee be the Kingdom, the Sceptre, and the Splendour: Malkuth, Geburah, Gedulah, The Rose of Sharon and the Lily of the Valley, Amen! [Sprinkle Salt before Earth tablet.] Let the Earth adore Adonai! [Make the Invoking Pentagram of Spirit Passive, and pronounce the Names: AHIH. And Elohim said: Let us make Man in Our own image; and let them have dominion over the Fish of the Sea and over the Fowl of the Air; and over every creeping thing that creepeth upon the Earth. and the Elohim created ATh-h-ADAM: in the image of the Elohim created They them; male and female created They them. In the Name of ADNI MLK, and of the Bride and Queen of the Kingdom; Spirits of Earth, adore your Creator! [Make the Sign of Taurus.] In the Name of AVRIAL, great archangel of Earth, Spirits of Earth, adore your Creator! [Make the Cross.] In the Names and Letters of the Great Northern Quadrangle, Spirits of Earth, adore your Creator! [Sprinkle water before Earth Tablet.] In the three great secret Names of God, MOR, DIAL, HCTGA, that are borne upon the Banners of the North, Spirits of Earth, adore your Creator! [Cense the Tablet.] In the name of IC-ZOD-HEH-CA, great king of the North, Spirits of Earth, adore your Creator! In the Name of Adonai Ha-Aretz, I declare that the Spirits of Earth have been duly invoked. The mighty sounds have entered into the third angle, and are become as olives in the Olive Mount; looking with gladness upon the earth, and dwelling in the brightness of the Heavens as continual Comforters. Unto whom I fastened 19 Pillars of Gladness, and gave them vessels to water the earth with her creatures; and they are the brothers of the First and Second, and the beginning of their own seats, which are garnished with 69,636 ever-burning lamps: whose numbers are as the First, the Ends, and the Contents of Time. Therefore come ye and obey your creation: visit us in peace and comfort: conclude us receivers of your mysteries: for why? Our Lord and Master is the All-One! [Invokes: Nanta; the whole tablet of Earth. The angle of Earth of Earth. GIVE the Sign of Thoum-aesh-neith. [Knock.] Let us adore the Lord and King of Fire! Tetragrammaton Tzabaoth! Blessed be Thou! The Leader of Armies is Thy Name! AMEN! 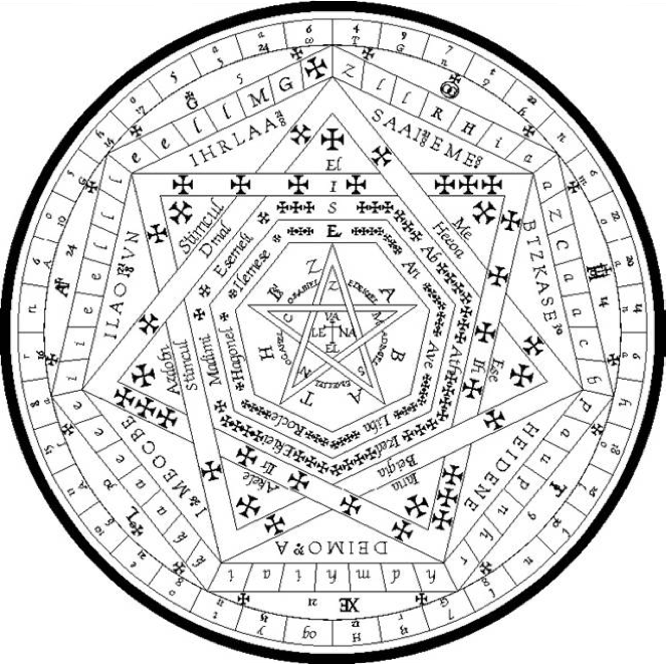 [Make the Invoking Pentagram of Spirit Active, and pronounce the Names: AHIH. [Make the Invoking Pentagram of Fire, and pronounce: ALHIM. [Make the sign of Leo with censer (or other suitable weapon).] In the name of MIKAL, archangel of Fire, Spirits of Fire, adore your Creator! [Make the Cross.] In the Names and Letters of the Great Southern Quadrangle, Spirits of Fire, adore your Creator! [Elevate censer.] In the three Secret names of God, OIP TEAA PDOCE, that are born upon the banners of the South, Spirits of Fire, adore your Creator! [Lower and lift censer.] In the Name of EDELPERNA, great King of the South, Spirits of Fire, adore your Creator! In the Name of IHVH TzBAVTh, I declare that the Spirits of Fire have been duly invoked. Therefore hearken unto my voice! I have talked of you, and I move you in power and presence, whose works shall be a song of honour, and the praise of your God in your Creation! [Invokes: BITOM; the whole tablet of Fire. THE East is a house of Virgins singing praises among the flames of the first glory wherein the Lord hath opened his mouth; and they are become 28 living dwellings in whom the strength of man rejoiceth; and they are apparelled with ornaments of brightness, such as work wonders on all creatures. Whose kingdoms and continuance are as the Third and Fourth, strong towers and places of comfort, the Seats of Mercy and Continuance. O ye Servants of Mercy, Move! Appear! Sing praises unto the Creator; and be mighty amongst us. For that to this remembrance is given power, and our strength waxeth strong in our Comforter! [Invokes the Angle of Water of Air in the tablet of Air. THE Midday, the first is as the third Heaven made of 26 Hyacinthine Pillars, in whom the Elders are become strong, which I have prepared for mine own Righteousness, saith the Lord: whose long continuance shall be as bucklers to the Stooping Dragon, and like unto the harvest of a Widow. How many are there which remain in the Glory of the Earth, which are, and shall not see Death until the House fall and the Dragon sink? Come away! for the Thunders (of increase) have spoken. Come away! for the Crowns of the Temple and the Robe of Him that is, was, and shall be, crowned, are divided! Come forth! Appear! to the terror of the Earth, and to our comfort, and to the comfort of such as are prepared. The Angle of Earth of Air in the tablet of Air. The Princess of the Rushing Winds, the Lotus of the Palace of Air. MICAOLI beranusaji perejela napeta ialapore, das barinu efafaje “Pe” vaunupeho olani od obezoda, soba-ca upaahe cahisa tatanu od tarananu balie, alare busada so-bolunu od cahisa hoel-qo ca-no-quodi “cial.” Vaunesa aladonu mom caosago ta insa olalore ginai limelala. Amema cahisa sobra madarida zod cahisa! Ooa moanu cahisa avini darilapi caosajinu: od butamoni pareme zodumebi canilu. Dazodisa etahamezoda cahisa dao, od mireka ozodola cahisa pidiai Colalala. Ul ci ninu a sobame ucime. Bajile? IAD BALATOHE cahirelanu pare! NIISO! od upe ofafafe; bajile a-cocasahe icoresaka a uniji beliore. A MIGHTY guard of Fire with two-edged swords flaming (which have eight Vials of wrath for two times and a half, whose wings are of wormwood and of the marrow of salt), have set their feet in the West, and are measured with their 9996 ministers. These gather up the moss of the Earth as the rich man doth his Treasure. Cursed are they whose iniquities they are! In their eyes are mill-stones greater than the earth, and from their mouths run seas of blood. Their heads are covered with diamonds, and upon their heads are marble stones.«v.l. “Upon their hands are marble sleeves.”» Happy is he on whom they frown not. For why? The Lord of Righteousness rejoiceth in them! Come away, and not your Vials: for that the time is such as requireth Comfort. The Angle of Fire of Air in the tablet of Air. The Lord of the Winds and Breezes; the King of the Spirits of Air. CORAXO cahisa coremepe, od belanusa Lucala azodiazodore paebe Soba iisononu cahisa uirequo opecopehanu od racalire maasi bajile caosagi; das yalaponu dosiji od basajime; od ox ex dazodisa siatarisa od salaberoxa cynuxire faboanu. Vaunala cahisa conusata das daox cacasa ol Oanio yore vohima ol jizodyazoda od eoresa cocasaji pelosi molui das pajeipe, laraji same darolanu matorebe cocasaji emena. El pataralaxa yolaci matabe nomiji mononusa olora jinayo anujelareda. Ohyo! ohyo! ohyo! ohyo! ohyo! ohyo! noibe Ohyo! caosagonu! Bajile madarida i zodirope cahiso darisapa! NIISO! caripe ipe nidali! THE Thunders of Judgment and Wrath are numbered and are harboured in the North, in the likeness of an Oak whose branches are 22 nests of lamentation and weeping laid up for the earth: which burn night and day, and vomit out the heads of scorpions and live Sulphur mingled with poison. These be the thunders that, 5678 times in the twenty-fourth part of a moment, roar with a hundred mighty earthquakes and a thousand times as many surges, which rest not, neither know any3) time here. One rock bringeth forth a thousand, even as the heart of man doth his thoughts. Woe! Woe! Woe! Woe! Woe! Woe! Yea, Woe be to the Earth, for her iniquity is, was, and shall be great. Come away! but not your mighty sounds! The Angle of Air of Water in the tablet of Water. The Prince of the Chariot of the Waters. OXIAYALA holado, od zodirome O coraxo das zodiladare raasyo. Od vabezodire cameliaxa od bahala: NIISO! sala-manu telocahe! Casaremanu hoel-qo, od ti ta zod cahisa soba coremefa i ga. NIISA! bagile aberameji nonusape. Zoda-care eca od Zodameranu! odo cicale Qaa! Zodoreje, lape zodiredo Noco Mada, hoathahe IAIDA! THE mighty Seat groaned, and there were five Thunders that flew into the East. And the Eagle spake and cried aloud: Come away from the House of Death! And they gathered themselves together and became (those) of whom it is measured, and it is as They are, whose number is 31. Come away! For I have prepared (a place) for you. Move therefore, and shew yourselves! Unveil the mysteries of your Creation. Be friendly unto me, for I am the servant of the same your God: the true worshipper of the Highest. The Angle of Earth of Water, in the tablet of Water. The Princess of the Waters, the Lotus of the Palace of the Floods. O YE that range in the South and are the 28 Lanterns of Sorrow, bind up your girdles and visit us! bring down your train 3663 (servitors), that the Lord may be magnified, whose name amongst ye is Wrath. Move! I say, and shew yourselves! Unveil the mysteries of your Creation. Be friendly unto me, for I am the servant of the same your God, the true worshipper of the Highest. The Lord of the Waves and the Waters, the King of the Hosts of the Sea. O YE Swords of the South, which have 42 eyes to stir up the wrath of Sin: making men drunken which are empty: Behold the Promise of God, and His Power, which is called amongst ye a bitter sting! Move and Appear! unveil the mysteries of your Creation, for I am the servant of the same your God, the true worshipper of the Highest. The Angle of Air of Earth, in the tablet of Earth. The Prince of the Chariot of Earth. NORONI bajihie pasahasa Oiada! das tarinuta mireca ol tahila dodasa tolahame caosago homida: das berinu orocahe quare: Micama! Bial' Oiad; aisaro toxa das ivame aai Bala-tima. Zodacara od Zodameranu! Odo cicale Qaa! Zodoreje, lape zodiredo Noco Mada, hoathahe IAIDA. O YE Sons of fury, the Daughters of the Just One! that sit upon 24 seats, vexing all creatures of the Earth with age, that have 1636 under ye. Behold! The voice of God; the promise of Him who is called amongst ye Fury or Extreme Justice. Move and shew yourselves! Unveil the mysteries of your Creation; be friendly unto me, for I am the servant of the same your God: the true worshipper of the Highest! The Angle of Water of Earth, in the tablet of Earth. The Queen of the Thrones of Earth. ILASA! tabaanu li-El pereta, casaremanu upaahi cahisa dareji; das oado caosaji oresacore: das omaxa monasasi Baeouibe od emetajisa Iaiadix. Zodacare od Zodameranu! Odo cicale Qaa. Zodoreje, lape zodiredo Noco Mada, hoathahe IAIDA. O THOU, the Governor of the first Flame, under whose wings are 6739; that weave the Earth with dryness: that knowest the Great Name “Righteousness,” and the Seal of Honour. Move and Appear! Unveil the mysteries of your creation; be friendly unto me, for I am the servant of the same your God: the true worshipper of the Highest! The Angle of Fire of Earth, in the tablet of Earth. The Lord of the Wide and Fertile Land, the King of the Spirits of Earth. O THOU second flame, the House of Justice, which hast thy beginning in glory and shalt comfort the Just: which walkest upon the Earth with 8763 feet, which understand and separate creatures! Great art thou in the God of Stretch forth and Conquer. Move and appear! Unveil the mysteries of your Creation; be friendly unto me, for I am the servant of the same your God, the true worshipper of the Highest. The Angle of Air of Fire, in the tablet of Fire. The Prince of the Chariot of Fire. ILASA dial pereta! soba vaupaahe cahisa nanuba zodixalayo dodasihe od berinuta faxisa hubaro tasataxa yolasa: soba Iad i Vonupehe o Uonupehe: aladonu dax ila od toatare! Zoda-care od Zodameranu! Odo cicale Qaa! Zodoreje, lape zodiredo Noco Mada, hoathahe IAIDA. O THOU third Flame! whose wings are thorns to stir up vexation, and who hast 7336 living lamps going before Thee: whose God is “Wrath in Anger”: Gird up thy loins and hearken! Move and Appear! Unveil the mysteries of your Creation; be friendly unto me, for I am the servant of the same your God, the true worshipper of the Highest. The Angle of Water of Fire, in the tablet of Fire. The Queen of the Thrones of Flame. ILASA micalazoda olapireta ialpereji beliore: das odo Busadire Oiad ouoaresa caosago: casaremeji Laiada eranu berinutasa cafafame das invemeda aqoso adoho Moz, od maof-fasa. Bolape como belioreta pamebeta. Zodacare od Zoda-meranu! Odo cicale Qaa. Zodoreje, lape zodiredo Noco Mada, hoathahe IAIDA. O THOU mighty Light and burning Flame of Comfort! that unveilest the Glory of God to the centre of the Earth, in whom the 6332 secrets of Truth have their abiding, that is called in thy kingdom “Joy” and not to be measured. Be thou a window of comfort unto me! Move and Appear! Unveil the mysteries of your Creation, be friendly unto me, for I am the servant of the same your God, the true worshipper of the highest. The Angle of Earth of Fire, in the tablet of Fire. The Princess of the Shining Flame, the Rose of the Palace of Fire. THESE first 18 calls are in reality 19; that is, 19 in the Celestial Orders; but with us the first table hath no call, and can have no call, seeing that it is of the Godhead. Thus, then, with us hath it the number of 0, though with them that of 1. (Even as the first key of the ROTA hath the number 0.) After this follow the calls or keys of the Thirty Aires or AEthyrs: which are in substance similar, though, in the name of the AEthyrs, diversified. MADARIATZA das perifa LIL4) cahisa macaolazoda saanire caosago od fifisa balzodizodarasa Iaida. Nonusa gohulime: Micama adoianu MADA faoda beliorebe, soba ooaona cahisa luciftias peripesol, das aberaasasa nonusafe netaaibe caosaji od tilabe adapehaheta damepelozoda, tooata nonusafe jimicalazodoma larasada tofejilo marebe yareryo IDOIGO5); od torezodulape yaodafe gohola, Caosaga, tabaoreda saanire, od caharisateosa yorepoila tiobela busadire, tilabe noalanu paida oresaba, od dodaremeni zodayolana. Elazodape tilaba pare-meji peripesatza, od ta qurelesata booapisa. Lanibame oucaho sayomepe, od caharisateosa ajitoltorenu, mireca qo tiobela lela. Tonu paomebeda dizodalamo asa pianu, od caha-risateosa aji-la-tore-torenu paracahe a sayomepe. Coreda-zodizoda dodapala od fifalazoda, lasa manada, od faregita bamesa omaoasa. Conisabera od auauotza tonuji oresa; catabela noasami tabejesa leuitahemonuji. Vanucahi ome-petilabe oresa! Bagile? Moooabe OL coredazodizoda. El capimao itzomatzipe, od cacocasabe gosaa. Bajilenu pii tianuta a babalanuda, od faoregita teloca uo uime. O YE Heavens which dwell in the first Air, yea are mighty in the parts of the Earth, and execute the Judgment of the Highest! Unto you it is said: Behold the Face of your God, the beginning of Comfort, whose eyes are the brightness of the Heavens, which provided you for the Government of the Earth, and her unspeakable variety, furnishing you with a power of understanding to dispose all things according to the Providence of Him that sitteth on the Holy Throne, and rose up in the Beginning, saying: The Earth, let her be governed by her parts, and let there be Division in her, that the glory of her may be always drunken, and vexed in itself. Her course, let it run with the Heavens; and as an handmaid let her serve them. One season, let it confound another, and let there be no creature upon or within her the same. All her members, let them differ in their qualities, and let there be no one Creature equal with another. The reasonable Creatures of the Earth, and Men, let them vex and weed out one another; and their dwelling-places, let them forget their Names. The work of man and his pomp, let them be defaced. His buildings, let them become Caves for the beasts of the Field! Confound her understanding with darkness! For why? it repenteth me that I have made Man. One while let her be known, and another while a stranger: because she is the bed of an Harlot, and the dwelling-place of him that is fallen. O ye Heavens, arise! The lower heavens beneath you, let them serve you! Govern those that govern! Cast down such as fall. Bring forth with those that increase, and destroy the rotten. No place let it remain in one number. Add and diminish until the stars be numbered. Arise! Move! and appear before the Covenant of His mouth, which He hath sworn unto us in His Justice. Open the Mysteries of your Creation, and make us partakers of THE UNDEFILED KNOWLEDGE. Finished are the Calls or Keys. L A Z o d a P e L a M e D a Z o d a Z O D a Z o d I L a- Z o d U O L a T a Z o d a P e K A L a T a N u V a D a Z- o d a B e R e T a.
I R O A I A E I I A K O I T a X E A E O H e S I O I- I T E A A I E.
L a N u N u Z o d a T a Z o d O D a P e X a H E M- A O A N u N u P e R e P e N u R A I S A G I X a. Ended are the Forty-eight Calls or Keys. Collation of the various MSS. of these calls has not done away with Various Readings; and there is not enough of the language extant to enable a settlement on general principles. — ED. Read here Vooan in invocations of the Fallen Spirits. Or other Aire as may be willed. This name may be appropriately varied with the Aire.